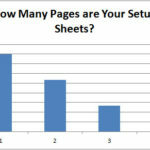 You know, those little pieces of paper or charts where you cram in a quick summary of everything you need to know to solve some type of problem quickly. Man, I got through college on my cheat sheets! 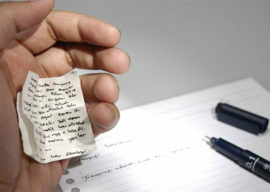 Now hang on, before you start thinking I was actually cheating, our tests at my school were all open book, open note, and usually unlimited time, so cheat sheets were allowed. And BTW, if you think that made the test easy, don’t I wish! The teachers all made the tests super hard knowing full well you had access to all that help. Recently, I decided to put together a cheat sheet to help folks with Feeds and Speeds. 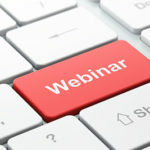 I take all the Customer Service inquiries here at CNCCookbook (except for just a few order-related ones), and I noticed a lot of people were asking a particular kind of question–they knew how to use the G-Wizard Feeds and Speeds Calculator in general, but they wanted to know how to influence its results to achieve certain goals. A lot of beginners want to know how to get G-Wizard to back off and make more conservative cuts. Pros want ideas for how to crank things up and shorten cycle times. Most folks are interested in tips for better tool life or surface finish. Many times, people were trying to get around some limit they’d hit. Either the spindle wouldn’t go as fast as G-Wizard suggested, or it wouldn’t go as slow (CNC Router users often run spindles with very high minimum speeds) as it wanted. You can imagine what happens if G-Wizard wants to go slower and they just ignore it and run at much faster rpms–tool life suffers considerably. I’ve written a couple of different articles to try to help folks “hack” their Feeds and Speeds to do what they want, but I finally realized I needed a quick and easy Cheat Sheet. Then, I could direct people to it and help them solve their problems more easily. 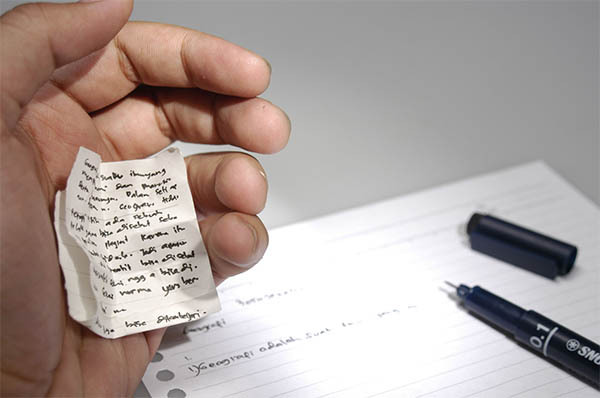 With the right cheat sheet, it can also open up your eyes to new possibilities you hadn’t considered. 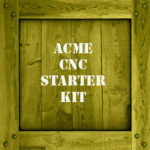 That’s helpful for any CNC’er! So, I started putting it together in Excel and then I had an inspiration: why not just build it directly into G-Wizard so it’s always handy? Under “I Want…” are various things you’d like to achieve–longer tool life, faster cuts, better surface finish, making millions (oops, just kidding about that one! ), and so on. Under “Change…” it tells you a little bit about what this accomplishes and suggests various things you might change to achieve your goal. For example, to get better surface finish, it suggests you “Set Tortoise-Hare further left.” Of course that’s what the Tortoise-Hare slider is especially good at. 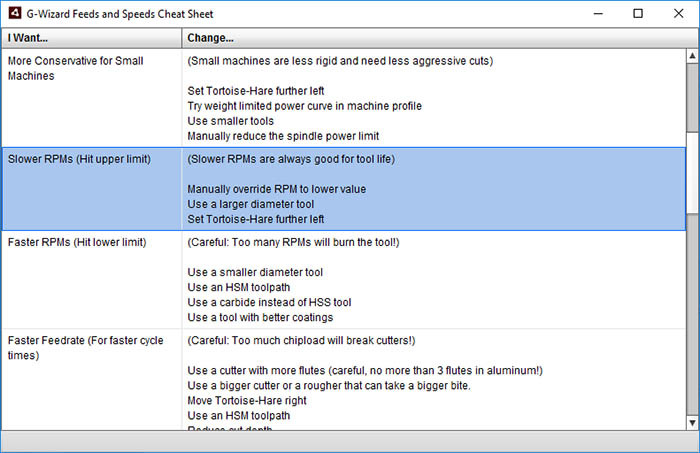 Notice that it first says, “( Slower RPM’s are always good for tool life )”. Those entries in parenthesis are like comments, they’re trying to give you the big picture idea about slowing down rpms. It’s true, lowering rpms will almost always improve tool life because it reduces heat. 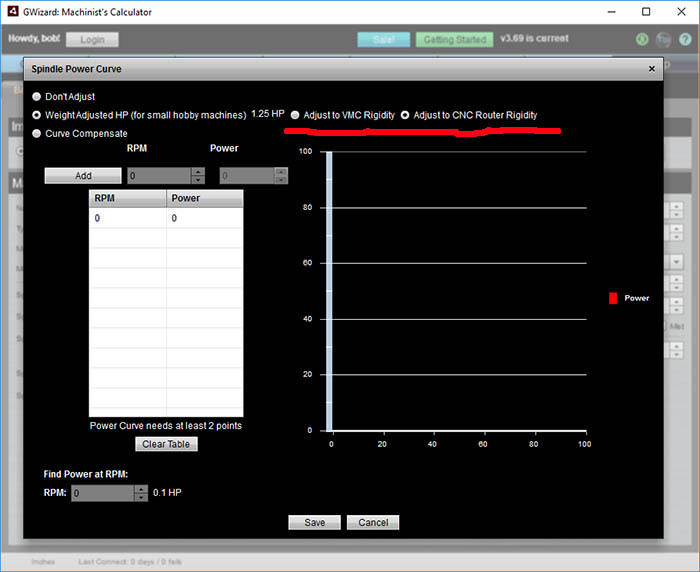 Manually override RPM to lower value. You can always do this in G-Wizard and it will adjust everything else accordingly. And, it’s good for tool life. Use a larger diameter tool. All other things being equal, larger diameter tools will run at slower rpms. Good tip! Set Tortoise-Hare further left. Eventually, this will lower rpms, although not a whole lot. I’ve tried to prioritize these in order and put the best ideas first. Go ahead, get that latest version and have a play with the new Cheat Sheet. Are there any goals I have missed? I tried to put in as many as I remember commonly hearing as part of our customer support inquiries. Did I miss some clever dodges to add as cheats? Mention any ideas you have in the comments below. Don’t Adjust: Assume the maximum horsepower is available at all rpms. This is often the easiest to get started with. Weight Adjust: Lighter machines are not as rigid, so we derate their spindle power so the cutting forces don’t bend their frames any more than larger machines. This is usually a good choice for lightweight hobby machines to keep them out of trouble. 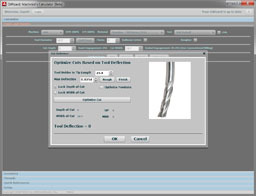 Curve Compensate: This lets you enter data points to create an rpm-adjusted power curve. A great many hobbyists with very lightweight machines have gotten tremendous benefit using the Weight Adjusted mode. For more details on the theory behind it, check out our article that analyzes Machine Rigidity. What we did with this feature, was to derate your spindle power curve were limited to forces commensurate with the ridigity of your machine. We derive an approximation of that rigidity by looking at the machine’s work envelope and its weight. A well-designed machine that concentrates all of its mass in a smaller space will be more rigid than if we spread that mass out over an extended area. 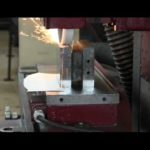 That brings us to the question of CNC Routers versus VMCs (Vertical Machining Centers, you know, like Haas milling machines and the like–industrial strength CNC Mills). Even fairly hefty CNC Routers are not built to be as rigid as a 6000 pound VMC. There’s no need–typically they’re used for wood and don’t need to hold tolerances that are nearly as tight. 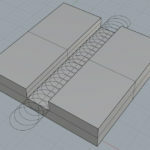 Given just how many folks using our software are CNC Router users, it seemed like a good idea to add an option to weight adjust for CNC Router rigidity. This lets them use more power and cut through wood (or whatever material they like) faster if they’re not so worried about tolerances. OK, what kind of tolerance differences? That’s a really complex question. For the sake of simplicity, let’s say you want to hold as tight as 0.001″ on the VMC (perhaps tighter) and 10x that or 0.010″ on the CNC Router. That’s approximately what we’re talking about here, give or take. This new option should be much nicer for folks running smaller CNC Routers. Incidentally, this feature was motivated entirely by a long discussion I had with a customer who really wanted to understand the Machine Rigidity Adjustment for his application. I really do get a lot of help from all the feedback you provide, keep it coming! I wanted to make our first new release of the year have some nifty stuff for all, so I plugged in one more little productivity shortcut that was again suggested by a customer. They wanted to save keystrokes copying feeds and speeds into their CAM software. 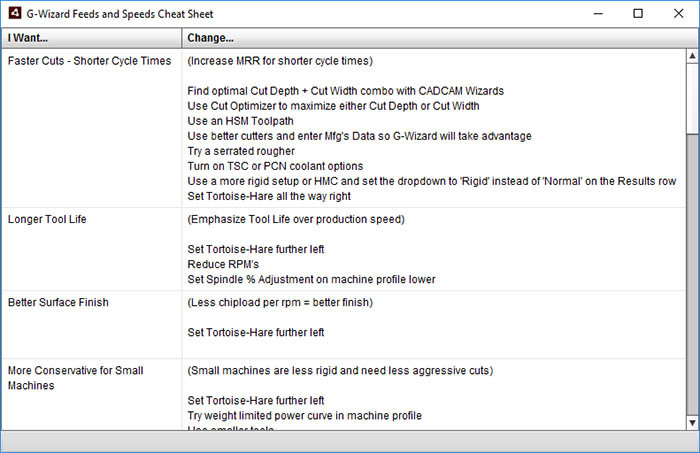 So, we now have two quick shortcuts, just click the title to copy either the RPMs or the Feedrate to the clipboard. This saves you having to select the text and copy it, quite a few mouse moves and keystrokes if you think about it. You don’t have G-Wizard?!?? Well heck, boogie on over to our G-Wizard page and try the Free Trial so you can play with it. We’ve got specialized features for every kind of CNC’er and some of the best tips and training in the land. No other product is backed by the 3000+ articles on CNCCookbook. We’ll have you generating better Feeds and Speeds in no time no matter what your experience level may be.